In one of our film clips a very experienced historian, Maceo Dailey, talks about the history classroom as a ‘sanctuary’ – a safe space. It feels at first glance like a word deeply out of time. In conditions of mass higher education, with seminar classes of 20-30 students and more (once the size of a lecture), a more appropriate term might seem to be a space of chaos where it’s hard as a teacher to navigate at all and where a jumble of half-formed opinions (at best) collide. And, of course, to call a classroom a sanctuary is profoundly out of kilter with prevailing policy discourse with its instrumental lexicon of learning and employability outcomes. All in all, it feels at first glance a word from a ‘world we have lost’ – strange, awkward and ill-fitting. How can such a word be appropriate today? Even if we wanted to, how in such conditions can we create such safe spaces for discussion amidst the clamour of voices (on a good day) and the multiple experiences and interests? And to some reading this, it might from the start seem deeply wrong to be talking about safe spaces in the history classroom. After all, aren’t we supposed to be unsettling our students – challenging, even disrupting, their beliefs and assumptions with new ideas, new ways of looking at themselves, others and the world? So this film clip got me thinking. And the more I think about it the more important I think it is see our role as to create safe spaces for learning, in spite of the arguments above; indeed partly because of them. In fact, it seems to me that we need these spaces more than ever. In the film clip, Maceo Dailey talks about creating a sanctuary where students can think like attorneys, like theologians – that is with rigour, critical spirit, integrity and an inquiring mind; where they can rehearse thinking about themselves, others and world through their encounter with historical actors. But he makes a final point that he wants his students to leave with more questions and I think this is the nub of it. The best teachers are those able to create spaces of safe uncertainty: where students can question; try things; get things wrong; where they feel they can chance a personal interpretation; where they learn about contingency; where they can struggle with the complexities of the world (of themselves). And a good history programme is one where students leave comfortable with ambiguity, doubt and uncertainty and able to negotiate these. To me these are attribute s worth having; far more than any long list of measurable transferable skills. They are worth having not only because they are what employers need from graduates today, but because they represent key characteristics of the sort of people who can cope and hopefully thrive in the contemporary world. To create a space of safe uncertainty in your class and programme is one of the best things you can do. Yet if we want to achieve this – to encourage students to think differently, challenge their habits of thinking – about their subject; their ways of learning; their ways of looking; become comfortable in uncertainty, this needs to be done in a manner sensitive to their stage and experiences of learning. And this is important. Creating such spaces is not a simple matter. It requires of teachers an attentiveness that is a key skill we have to develop. Students face a rollercoaster of emotions in their undergraduate journey. 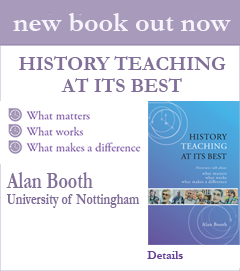 In one interview study I once conducted, final-year undergraduate students asked to describe what makes for a successful history class came up with first ‘security’ and ‘feeling confident enough in your group to say something’. All too often they said that in their first undergraduate years they hadn’t felt able to say anything but just repeated what historians had said. The sort of class I’m talking about only really works when students feel able to voice their (own) views in the first place – when the teacher creates a climate/atmosphere/ethos, call it what you will, in the classroom that lets students (as individuals and a collective) feel they can express their (own) views and feelings freely without risking embarrassment or loss of face; a classroom open to enquiry, exploration and creativity. Today, it seems to me that the job of creating such spaces is all the more important, not less. If we are to get our students to engage actively with learning and with history, and that means openly and honestly (not just repeating what they think we want to hear or what other historians have said), then it’s up to us to create spaces that encourage them to express themselves and explore subject and self in creative ways. There are many ways we can do this, as the historians in our film clips demonstrate. But do it we must, because otherwise there will be little chance of students challenging their own and others’ views, trying out new things and becoming the students we want them to be – rounded, self-aware people able to negotiate and thrive in conditions of complexity and uncertainty. At its best, history teaching is a particularly powerful vehicle for these qualities. Can we reclaim the word sanctuary? I’m not sure, but I do think that seeing the history classroom as a space of safe uncertainty expresses something deeply important that we and our students cannot afford to forget.